This board allows you to control high voltage and high current loads with your microcontroller project. 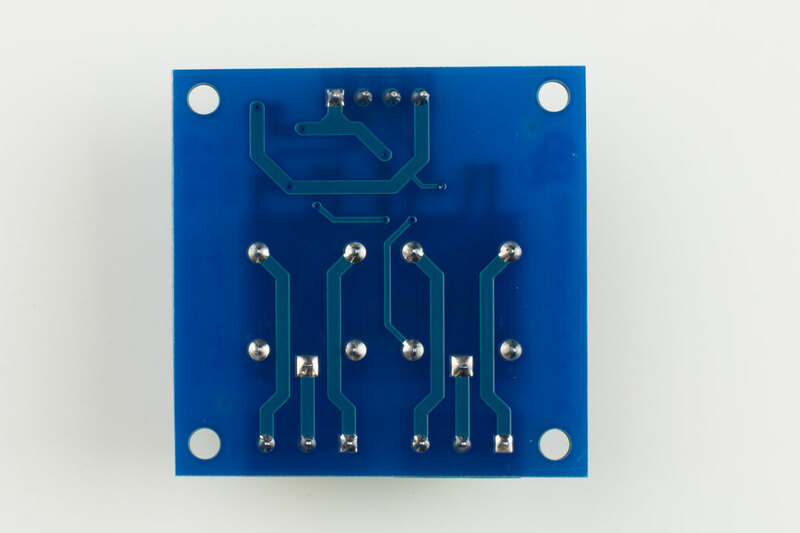 This board is fully assembled with standard spaced mounting holes for easy integration into your new or existing projects. 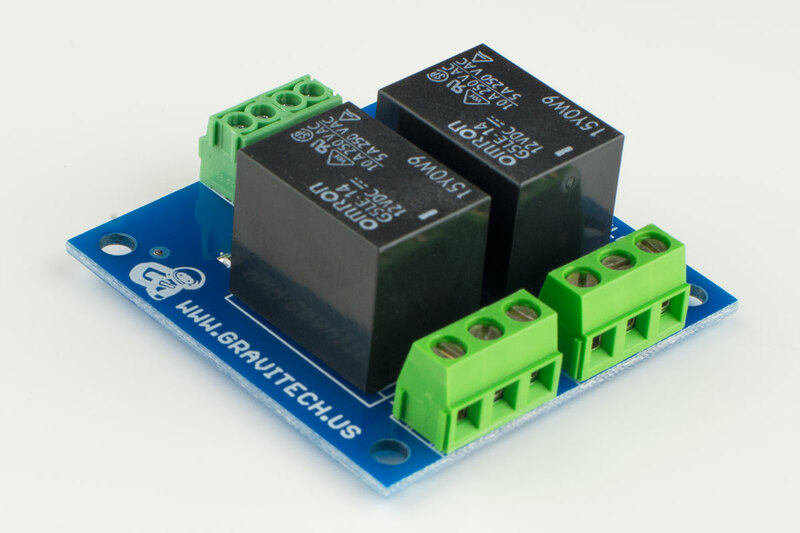 Simply connect your low voltage and high voltage leads, and start controlling your robotics, household automation, or other controller dependent projects right out of the box! 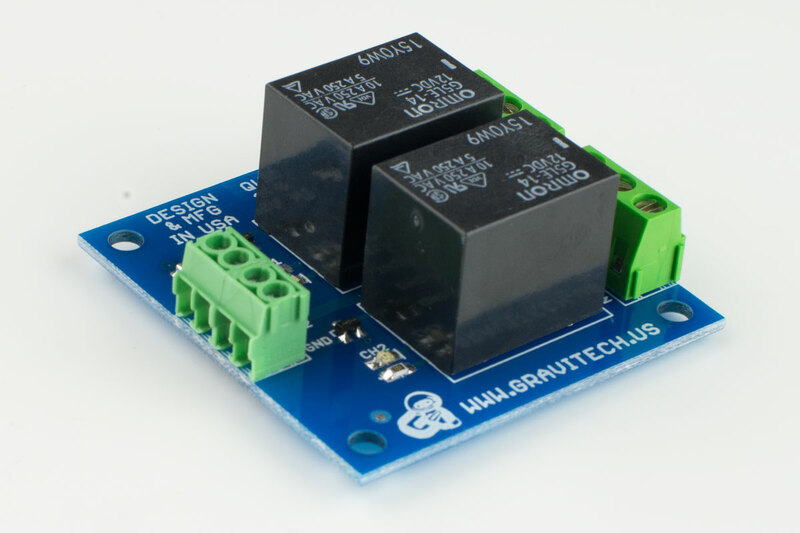 This board is great for applications where you want to safely isolate your microcontroller logic from your high voltage or high current circuits (and the noise they create for) up to 2 channels. 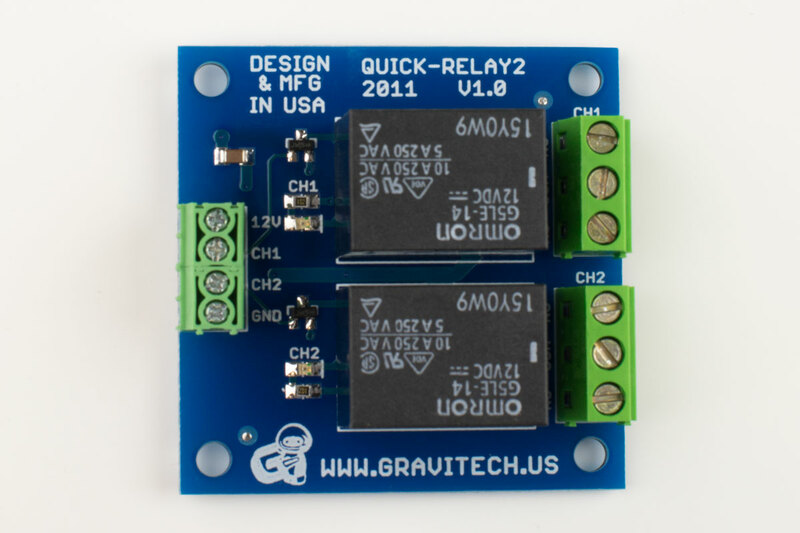 The Quick-Relay 2 board is small (2” x 2” x 0.75“ tall), with an integrated circuit that protects your microcontroller from any kickback voltages that may occur from inductive loads in your switched circuits. 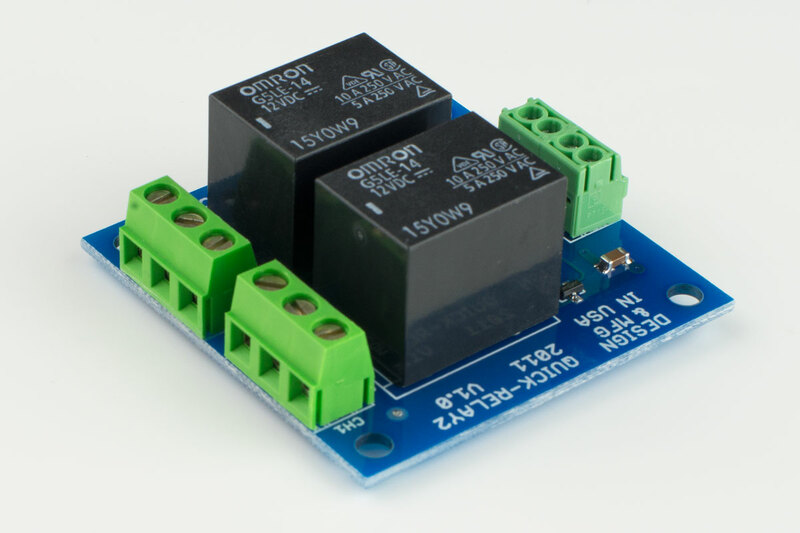 This board is capable of controlling two channels, using up to 12 volts to switch 120VAC, 240VAC, or 30VDC – compatible for use with all common microcontrollers in the hobbyist market. Features high quality components - includes a heavy duty PCB with high current traces, heavy duty connectors that are capable of handling larger wires, sealed relays, and protection circuitry that will keep your microcontroller safe and your project running without fail. • Heavy duty PCB and traces to ensure reliable performance. • High capacity connectors to accommodate larger gauge wire. • Small form factor (2” x 2” x 0.75”) featuring four (4) 0.15” mounting holes. 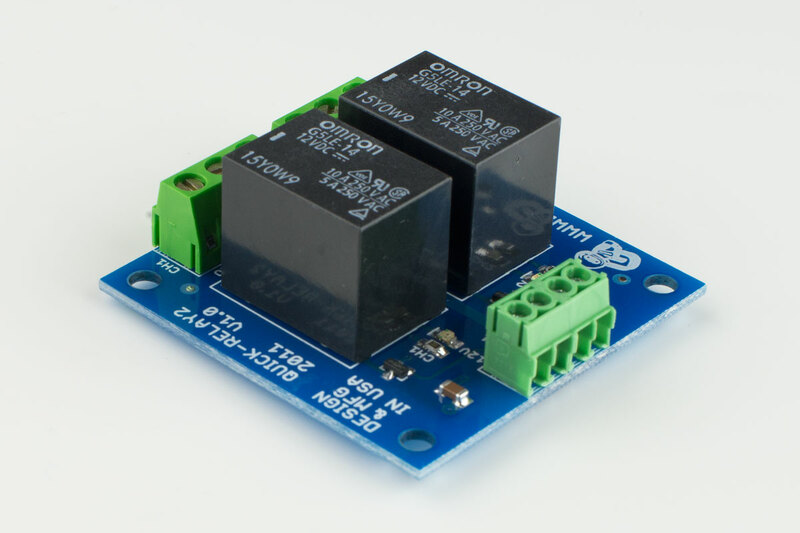 •Connect +12Vdc and Ground to the marked pins. •Connect Channel 1 and Channel 2 to different pins on your microcontroller. •VCC to the common terminal (COM). •Connect positive input of your load into the normally open () or normally closed () output from channel 1 or channel 2, depending on your desired behavior. •Connect the return side of your load to ground. •When the controlling pin voltage runs HIGH, current will flow from the common terminal (COM) through the normally open (NO) pin and will not flow through the normally closed (NC) pin on either channel. •When the controlling pin voltage is set LOW, current will flow from the common terminal (COM) through the normally closed (NC) and will not flow through the normally open (NO) pin.